Giselle Gyalzen is the owner of the San Francisco store Rare Device. She joined us in the Aeolidia Facebook group for a Q&A about wholesale, answering questions about getting into stores and approaching store owners/buyers. Creative product-based businesses, come join us! There will be more of these. As the owner of Rare Device, a design-focused gift and home shop in San Francisco, Giselle is an expert at curating a selection of products that her customers will love. She gets many pitches from business owners who want to sell their work in her store. She answered questions for us from designers and makers about how they should best approach shop owners to pitch their products. We’ve tidied up the Facebook back and forth into something readable so we won’t lose this great info, and you can see Giselle’s thoughts on approaching store owners to sell your product here. All quoted text below is from Giselle, and all bold text is from our Facebook community. I’m wondering what is the best way via email to approach store owners and buyers – how many images, links, etc. I would say 1-2 attachments at the most. When you email them, have everything ready – your website is a great way to show them who you are vs. sending a lot of attachments. Linesheets/catalog, wholesale terms, product descriptions and images are key. What do you like and not like about being approached from vendors? If you are going in person to the store without an appointment, do not expect the person behind the counter to look through your products. They are usually in the middle of something, even if it doesn’t look like it. Instead, have a packet or sample ready and leave it with them, then follow-up via email in a few days or a week. Do you prefer to become acquainted with a new designer via email with a pdf/few images or snail mail with samples and a printed catalog? Is snail mail (a nice packet of info, maybe even samples) welcome, or is that too much? Either way is great as long as it has all the information. The easier you make it for us, the better! I’d be interested to know what your personal preferred method of first contact for a pitch would be: email with nice photos, snail mail with brochure or a spontaneous personal visit with promo material and real product samples? For our store, we actually have an online submission form. This is so that we can stay organized and have all of our submissions in one place. What I like – I like when you are ready with all the information I need to see and I can see that you took the time to compile it together – linesheets/catalog, a website, great images of your product, wholesale terms. Also say something about why you think your product is a good fit for the store that you are approaching. What works for the subject title? I imagine that store get a large volume of email. I’d love to know your stance on keeping contact with buyers you already have. I go through Etsy Wholesale right now, so I’m not sure how to go about keeping in contact. When I should ask them if they want to reorder (or if I should at all), since they usually just find me right through that platform without an email exchange first? And often, my buyers currently seem to order fairly often, when it’s right for them, without me needing to contact. I think the most efficient way is to have a wholesale only newsletter where you update us with new products every season. If you want it to be a bit more personal, then a personal email addressed to me with an updated catalog of links to your new line on your website. Would you recommend then, for the wholesale newsletter, that once I get an inquiry or new order, I ask if they’d like to join my newsletter list for future info/product releases? Just trying to figure out the best way to let them know it’s available (I do currently have a wholesale newsletter, haven’t used it yet since it’s brand new, but it’s there for them to join). Yes, you should ask and make sure to let them know that the purpose of it is so that they won’t think it’s just another thing on their inbox. How about the tricky business of negotiating consignment vs. outright purchase of goods with shop owners? And, of course, the shop/artist percentage split if goods are consigned? 50/50 seems to be the only choice? Depending on what your product is, I would approach them with wholesale in mind. If the store wants to go consignment, they will ask you. Then you have to ask what their policies are, get something in writing so that everything is clear and you won’t have to go chasing that payment around. Are phone calls (to follow up on a new release snail mailing) a no-no or a good way to remind buyers about your new goods? For me personally, I would say no phone calls. I am usually working up front and cannot chat for too long when there are customers. Email or snail mail is best. If you are a stationery company, definitely do the snail mail route, or both! How do you feel when asked to check out a makers wholesalecrafts.com or etsy wholesale page? I love looking at wholesale sites that have your pictures, policies and something about you and your company. How often do you prefer your vendors to check in with you (especially not the ‘regular’ vendors you reorder from all the time)? Depending on what your product is, I would say once every season or whenever you have a new line/new group of designs coming out. We always want to see the latest from brands that we already carry. In general, it’s really important to keep in contact with your buyers. For us at least, we have hundreds of brands we buy from so if you are fresh on our mind, then we will likely order from you more regularly. I have had several stores say something similar to “I like your cards but we aren’t buying right now. We will keep you on file” How sincere of a response do you think this is or are they just too nice to say no? Also how long should I wait to approach them again? This is true in my case! We have 2 small stores and don’t always have room for all the brands we want to buy. I would reply to them and say, great I’ll follow-up with you in a month (or 2) and then do follow-up. How long would you say it takes for you to go from receiving snail mail from a new brand to actually ordering from them? This all depends on how full the store is, so it’s a case by case. But I have to tell you we got this pretty package from a stationery line a few days ago and I was just wowed by their presentation – a box gift wrapped, tied with a bow with the most wonderful holiday cards inside, and they’re on our buying list now. See how you can stand out without being too much. The National Stationery Show is also a great time to send mail to buyers because we get a ton of them around that time of year and we are paying attention. We get so many pretty packages then, it’s my favorite time of year! What is the best way to approach a store that you feel your products would be the perfect fit for? Look through their site to see if they have submission guidelines. For us, we have an online submission form that we ask you to fill out. If they don’t have one, email or snail mail is best. Or both. Also, tell them why you think it’s a great fit! Do most stores have a policy or restrictions about a company selling to other stores in their area or within a certain number of miles? Yes, we don’t want every store in our city to carry the same products that we do. IMHO, it also keeps your products special if you are not everywhere – it really depends on your business plan, though, and what you are selling. But I respect my neighbor stores’ area and will not carry a brand if it’s carried 2 blocks away. Meet Giselle: Giselle is the owner of Rare Device, a brick and mortar store in San Francisco which is filled with lovely, approachably designed items for your home, yourself, and your family. Every object in the store has its own story, and has been chosen because it is either handmade, well-designed, useful, beautiful or all of the above. The aesthetic is modern and whimsical while remaining warm and inviting. The gallery within the storefront hosts monthly art shows and community events, including book signings, workshops, our monthly kids’ event, and trunk shows. For the gallery and in the shop, Giselle looks to showcase independent artists with great talent who are trying to say something bold in the world. PS – Go read our interview with Giselle about her rebranding and website project with us! PPS – If you are interested in learning more about wholesale, here is our archive of wholesale blog posts. 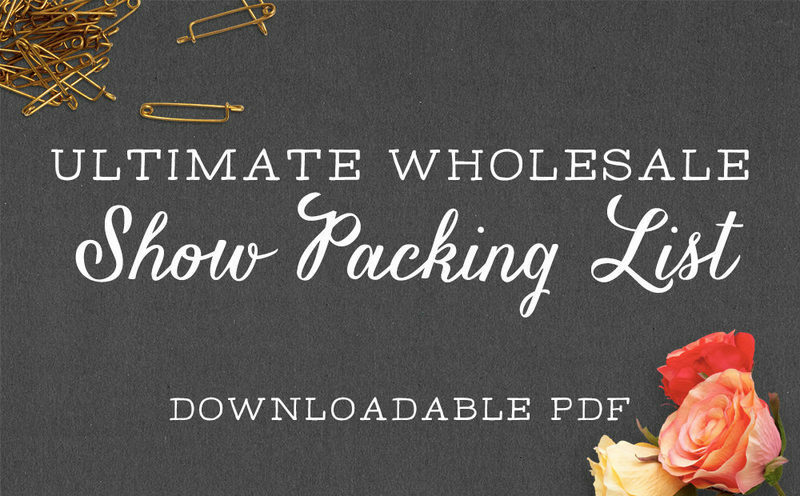 14 stationery companies shared their own trade show packing lists with us, and we’ve compiled it into a master list. As an SME business not long established, I have been introduced to a big retail chain asking for more details about our product. Having drafted an email to submit I’m a little unsure if should go in as a wholesaler requesting a minimum order quantity. I would be very grateful for your help on this issue. Yes, a retail chain is expecting you to work with them as a wholesaler, with a minimum order amount.